Australia’s Windmill Theatre returns to Vancouver as part of the Carousel Theatre for Young People 2019-2020 season with its production of BEEP. World Theatre Day was the backdrop for the Carousel Theatre for Young People 2019-2020 season announcement that will include shows for theatre-goers as young as two-years old, teens, and their families. The season gets underway with its annual Teen Shakespeare Program show on the Performance Works outdoor stage. This year Mike Stack puts a group of sixteen teens, aged 13 to 17, through their paces in an adaptation of the Bard’s The Winter’s Tale (Jul 26-Aug 10). Following a brief break, the company moves indoors to Granville Island’s Waterfront Theatre with The Rainbow Fish (Oct 1-6). From Nova Scotia’s Mermaid Theatre, co-presented with Vancouver’s Axis Theatre Company, it is adapted from Swiss author and illustrator Marcus Pfister’s children’s books, and will feature black-light puppetry in a show recommended for ages two to seven years. Later the same month comes The Incredible Adventures of Mary Jane Mosquito (Oct 30-Nov 10), a new play from Canadian playwright Tomson Highway. For children aged four and up, the show combines music, song and Cree phrases to tell its story of a misfit searching for her place in the world. Next up is the British Columbia premiere of Bad Hats Theatre’s Peter Pan (Nov 20-Jan 5). In this new adaptation of the J. M. Barrie classic, comes the story of the boy who would never grow with a musical reimagining from Fiona Sauder and Reanne Spitzer with music by Landon Doak, and arrangements by Nathan Carroll and Company. The first production of 2020 sees the return of Australia’s Windmill Theatre to Vancouver with a production of BEEP (Feb 11-23). A story of unexpected friendship, it is recommended for those aged two to seven years. The Hundred Acre Wood then comes to life in The House at Pooh Corner (Feb 28-Mar 29). In association with North Vancouver’s Presentation House Theatre, children three to eight will be transported to the world of Winnie-the-Pooh and his friends through music and puppets. 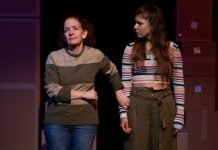 Closing out the season is the award-winning Green Thumb Theatre production of Still/Falling (Apr 21-26) by Vancouver playwright Rachel Aberle. The story of a young girl trying to come to terms with what it means to struggle with anxiety and depression is recommended for those twelve years and older. Play Packs for Carousel’s 2019-2020 season are currently on sale, with single tickets going on sale June 3. Visit carouseltheatre.ca for more information.